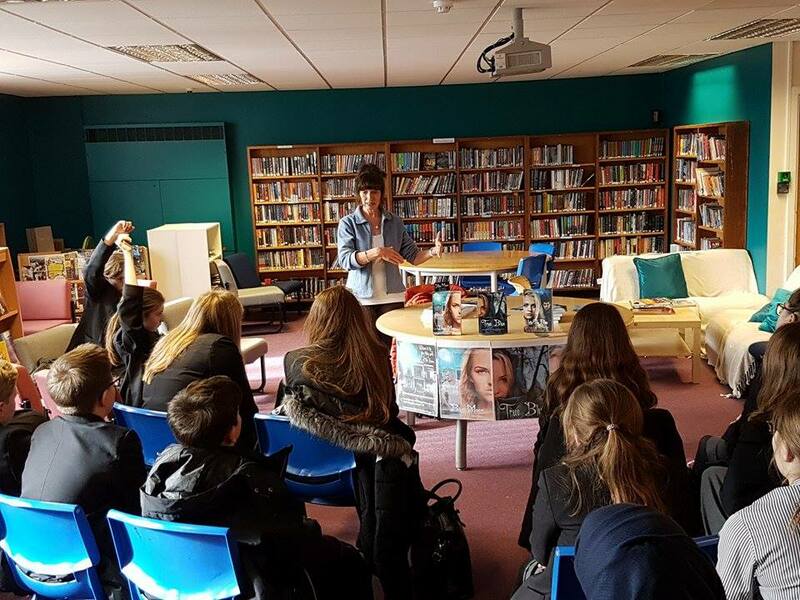 I had a lovely time visiting Heart of England School library in Balsall Common, talking to a group of students about my books for World Book Day. They asked some excellent questions and were hugely enthusiastic. 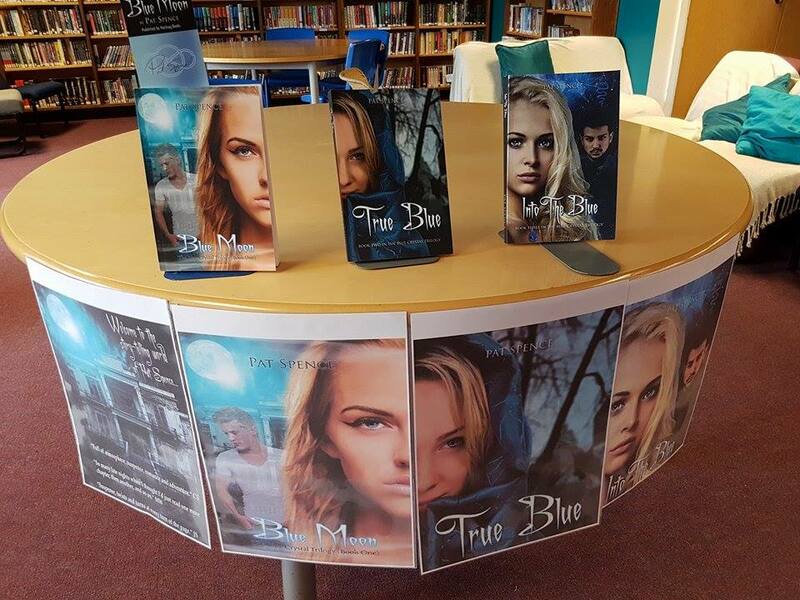 The library had been decorated by school librarian, Kirsty Kinmond, with copies of my books and specially prepared posters. 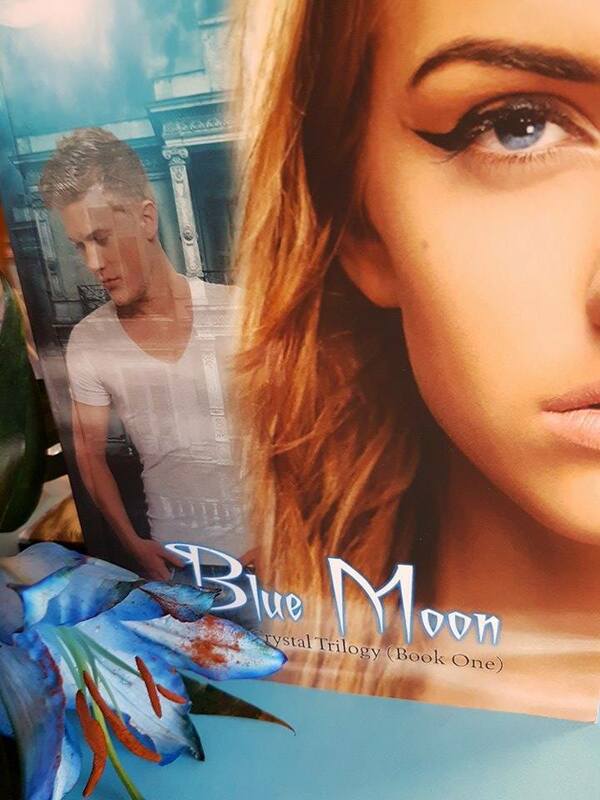 I also launched a competition for Best Short Ghost Story, with signed copy of Blue Moon as the prize. 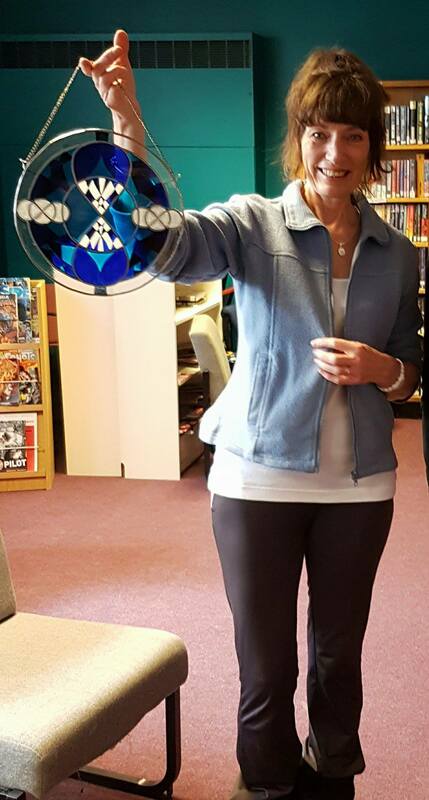 I was also presented with a beautiful blue glass suncatcher featuring symbols from The Blue Crystal Trilogy, specially created by glassmaker, Dan Shuttleworth (https://www.facebook.com/dan.shuttleworth.188). To celebrate World Book Day 2017 at Heart Of England School local author Pat Spence will be coming in to talk to students who are interested in writing and the Book Club. 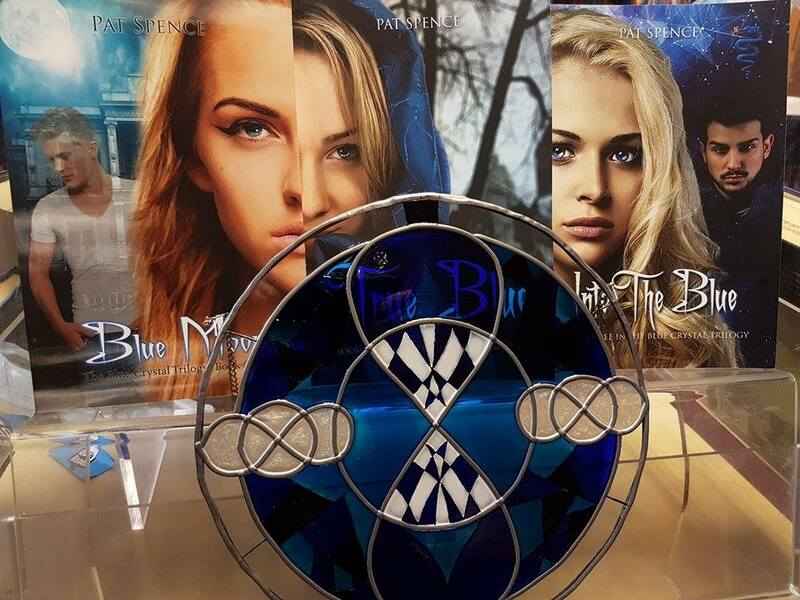 Pat Spence is a local author who has written a trilogy of books belonging in the True Blue series; Blue Moon, True Blue and Into The Blue. 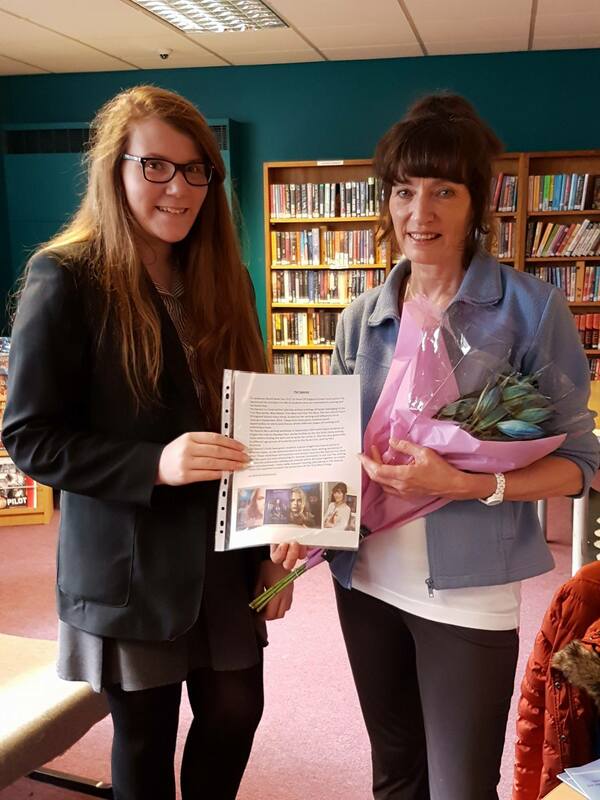 She has visited Heart Of England School many times, to discuss her writing and influences since coming in September 2014. These visits have given students great opportunities to talk to and discuss all the different stages of creating and publishing a book. Pat Spence did a writing workshop in September 2014, which gave students an insight into how to develop their stories further as she has tried many writing styles before finding the best one to write her series in. She has also given talks to different age groups of students and to the Book Club, lead by Mrs. Kinmond. Pat Spence’s visits have given students a great insight into how to write in different styles, as she demonstrated in her horror-story writing workshop in 2014. These workshops and question and answer sessions Pat Spence has done over the years are very interesting for anyone interested, in not just the writing but also the publication, editing and artwork, which all come together to create each individual book. I have really enjoyed meeting and talking to Pat Spence when she explained in depth the production of her True Blue trilogy.